As you see in below image you can add multiple bundles for a base product. Discount Amount defines the amount of discount to be applied on a bundle. Use Percentage defines if the discount amount is in percentage or not. 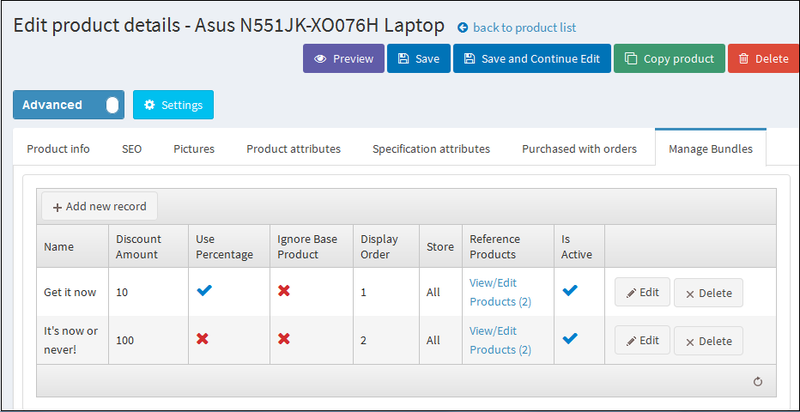 Display Order defines the sequence in which bundles will be displayed to the customer on product details page. Store defines the store for which the bundle is to be displayed. Reference Products provides a link to add products to a bundle and displays number of products currently added to the bundle. Is Active defines whether a bundle is in active state or not. If not in active state, bundle won't be displayed to the customer on product details page. You can configure bundle products by clicking on the link that says Reference Products for a bundle.